← Hobo With a Shotgun, Small Sur w/ the Missionaries, Dogtown Roadhouse & More! With a lot of stuff going on this week its hard to choose between them all. Here’s a listing of just a few great happenings starting with the Top 3! On Thursday (6/23) Magic Twig Community flagship band the Sad Cobras play at the Bazaar. Opening for the Cobras will be Birmingham, Alabama band, the Grenadines. Come out, pick up a Cobras/ Hot Lava 7″ and introduce yourself to another great new band making their way through Roanoke! This show starts at 8pm and costs $5! In Blacksburg on Friday (6/24) She-Sha will host a fond farewell to the Blind Photographers. AK Kanode’s brand of dance pop has built quite the popular following in Blacksburg over the past couple of years. Now Amy plans to head to the Northwest but doesn’t want to leave without one last show. Playing with her will be Harrisonburg dance duo, Mirror Kisses. Fronted by a former band member of Amy’s (George Clanton) Mirror Kisses is new wave the way it was intended and is one of our favorites! Above is a video for Mirror Kisses “Haunt Me”. 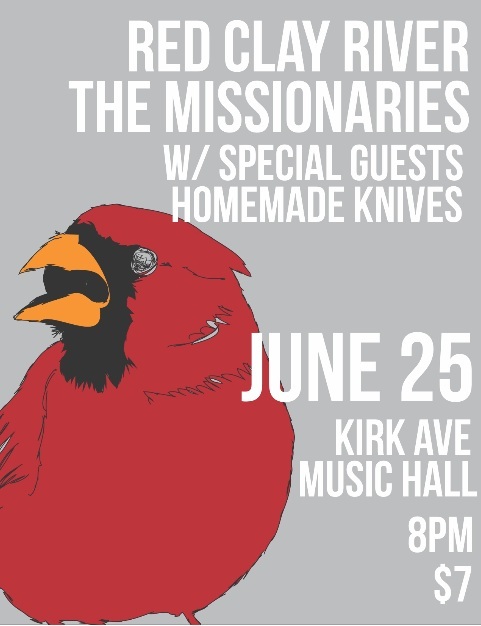 On Saturday (6/25) the Bazaar will host its 3rd installment of “the Bazaar Presents” at Kirk Avenue Music Hall. Richmond band and Triple Stamp Records flagship Homemade Knives will be headlining. Providing support will be Roanoke bands Red Clay River and Magic Twig Community outfit, the Missionaries. This is an important show not only for the Bazaar but also for Red Clay River who will be performing for the last time. Come and bid Red Clay River a proper farewell and enjoy an evening with friends! This show starts at 8pm and costs $7! Here’s a list of other great happenings this week…. Wednesday (6/22) Twin Killers! w/ Life in a Foxhole, KURU and Loser Yesterday @ Jax, Blacksburg. 8pm, $5. Thursday (6/23) Mirror Kisses w/ Double Hive Five @ Blue Nile, Harrisonburg. 8:30pm, $3. Friday (6/24) Godard film “Masculine Feminine” @ the Shadowbox, Roanoke. 8pm, $5. Friday (6/24) Johnson’s Crossroad @ Sun Music Hall, Floyd. 8pm, $5. Friday (6/24) Heavy Cream w/ No Brainer @ Twisted Branch Tea Bazaar, Charlottesville. 9pm, $5. Friday (6/24) Ol’ Spatch, Sharayah Spears, PJ Bond and Brian McGee @ Bazaar Consignments, Roanoke. 9pm, $5. Saturday (6/25) Artimus Pyle (of Lynrd Skynrd) @ Sun Music Hall, Floyd. Doors at 8pm, show at 9pm. Saturday (6/25) Summer Solstice Power Jam 2011 featuring Hot Lava, Diamond Center, Peace Beast, Nick Coward & the Last Battle, White Laces and more! @ Belle Isle, Richmond. 1pm-8pm, Free. Sunday (6/26) Vanguard: the Worst Movie Ever Made @ Guerrilla Cinema (Studio Roanoke), Roanoke. 8pm, $5. Lastly check out the new web commercial for Bazaar Consignments below! Shot and directed by Cory Greer and music provided by Doug Cheatwood! Cameos by a few local musicians in the commercial! Below is the commercial! This entry was posted in Cinema, Music and tagged Artimus Pyle, blue nile, Brian McGee, Diamond Center, Double Hive Five, Guerrilla Playhouse, Heavy Cream, Homemade Knives, Hot Lava, jax, Johnson's Crossroad, Kirk Avenue Music Hall, KURU, Life In A Foxhole, Loser Yesterday, Masculine Feminine, Mirror Kisses, Nick Coward & the Last Battle, No Brainer, Ol' Spatch, Peace Beast, PJ Bond, Red Clay River, Sharayah Spears, She Sha, Studio Roanoke, Summer Solstice Power Jam 2011, Sun Music Hall, The Bazaar, the Blind Photographers, the Grenadines, The Missionaries, The Sad Cobras, The Shadowbox, Twin Killers!, Twisted Branch Tea Bazaar, Vanguard, White Laces. Bookmark the permalink.